Tiny feet stomp down the hallway like a herd of buffalo, and internally, subconsciously, instinctively, I know what the sock-padded reverberation represents and exactly which part of the house it is coming from. Most importantly, I know that the steady sound of a toddler’s feet–intentionally using the floor as an instrument like a tap dancer–means everything is alright. It is in the moments of silence, in contrast, when the mother wonders what is going on and abandons the pot of soup bubbling on the stove or the dishes still soapy in the sink, prepared to engage in some sort of intervention or diversion. Such is my life as a mother who renews her enthusiasm day after day to also carve out time for her creative pursuits. The quiet, leisurely cooking that could happen during naptime often gives way for writing, and a simple beet salad takes several hours to prepare, from start to finish, with all the activity present at any one moment. It is on the multi-tasking days, when I cook while my son plays, when I most need to simplify my cooking and trust what I’ve learned throughout all my years in the kitchen. And considering naptime makes grocery shopping and cooking on the same day difficult, having a well-stocked pantry and fridge is a good thing. Those pantry items–high-quality canned salmon, pasta, crispbread and other crackers, canned beans, pickled vegetables, and more garlic and onions than I know what to do with–mean that a quick meal or snack is always possible, if I can drum up the creativity with which to envision it. 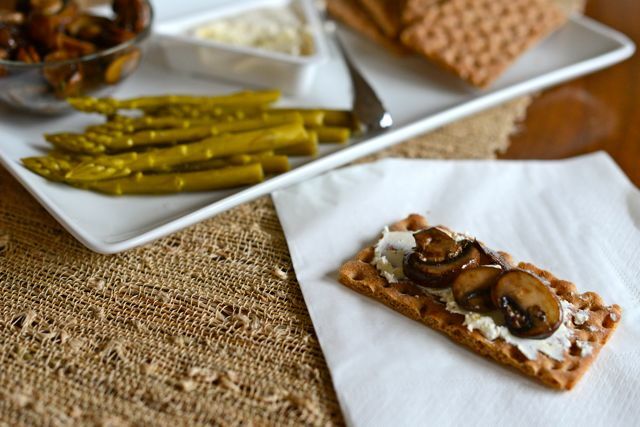 The recipe I’m sharing with you today–Norwegian Goat Cheese with Mushrooms, Pickled Asparagus, and Crispbread–represents the possibilities that come from having good food on hand at all times, whether they’re pantry staples or refrigerated items with a long shelf life. In fact, I had everything on hand for this recipe before going to the store the other day, except for the mushrooms. I’ve been trying to learn more about Norwegian cheeses, and I had a container of Snøfrisk in the refrigerator waiting to be enjoyed. 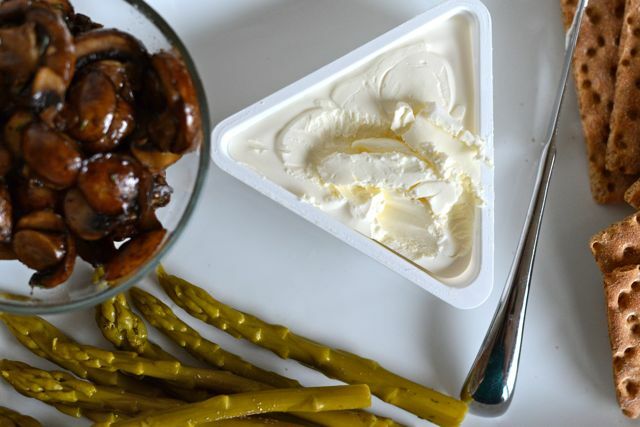 What would go well with any type of spreadable goat cheese with a soft flavor and creamy consistency? 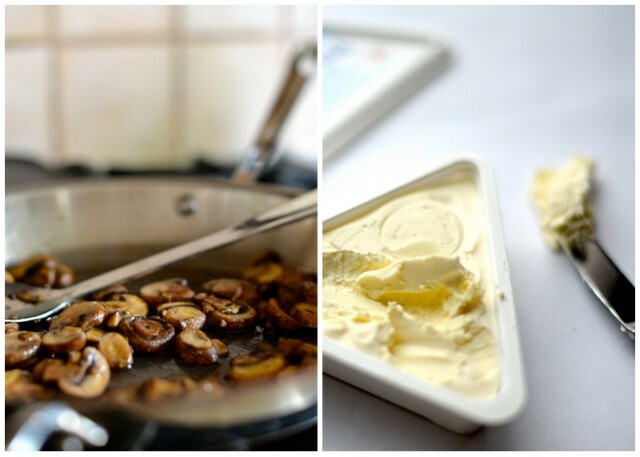 Sautéed mushrooms with a little bit of garlic and thyme seemed like a natural pairing. 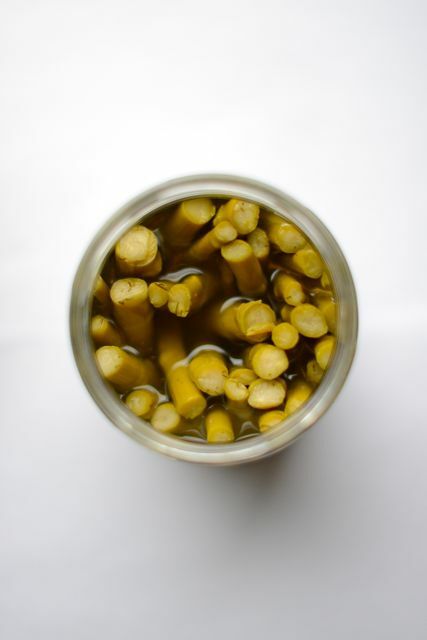 And what about that jar of gourmet pickled asparagus spears in the fridge? As I suspected, that was just what the other ingredients needed to round everything out. Served on crispbread–another pantry staple–with a cold beer, this was just the thing to have waiting on the counter for an after-work, pre-dinner snack. Heat olive oil in a large skillet until shimmering. Add garlic and saute over medium heat until fragrant, about 30 seconds. Add mushrooms and continue to saute, stirring frequently, until tender and almost done. Add thyme and continue to saute until mushrooms are done. Season with salt to taste and transfer to a small serving bowl. 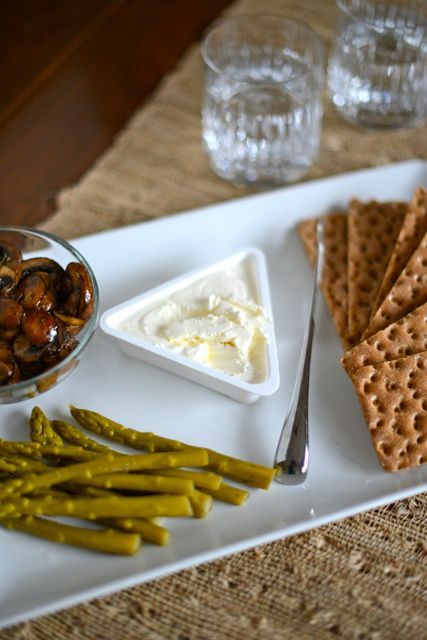 Arrange mushrooms, goat cheese, pickled asparagus, and crispbread on a platter and serve.